(a) As a colonist with Austin's Old Three Hundred, or any colonies authorized under the Spanish or Mexican governments before the Texas Revolution or those authorized by the Congress of the Republic of Texas. (b) As an officer or private in the service of the Colonies or of the Republic of Texas. (d) As a recipient of a land grant authorized by the Provisional Government of the Republic of Texas. Those grants include "Toby Scrips;" head rights, first, second, third, and fourth class; preemption grants; land scrips; colony contracts; bounty certificates; and donation certificates. 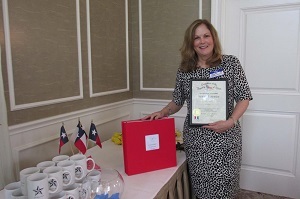 Our chapter meets on the first Thursday of each month October through June at 10:00 a.m. at the Pioneer Memorial Log House Museum located at 1510 Cambridge Street (formerly MacGregor), Hermann Park, Houston, Texas. The Daughters of the Lone Star Republic was organized by cousins Betty Ballinger and Hally Bryan. They conceived the idea in 1891 of perpetuating forever the memory of the Texas pioneer families and soldiers of the Republic of Texas by forming an association of their descendants. This organization would soon come to be known as The Daughters of the Republic of Texas. The San Jacinto Chapter was organized on November 9, 1891 by Mesdames Anson Jones, Andrew Briscoe, E. H. Vasmer, J. R. Fenn, A. B. Looscan, J. J. McKeever, and Misses Annie Hume and Belle Fenn. To perpetuate the memory and spirit of the men and women who achieved and maintained the independence of Texas. To encourage historical research into the earliest records of Texas, especially those relating to the Revolution of 1835 and the events which followed; to foster the preservation of documents and relics; to encourage the publication of records of the individual service of the soldiers and patriots of the Republic, and other source material for the history of Texas. To promote the celebration of Texas Honor Days: Lamar Day, January 26; Texas Statehood Day, February 19; Texas Independence and Flag Day, March 2; Alamo Heroes Day, March 6; Goliad Heroes Day, March 27; San Jacinto Day, April 21; Texian Navy Day, the third Saturday of September; Gonzales Day, October 2; Stephen F. Austin's Birthday, November 3, and Founders Day, November 6. To memorialize all historic spots by erecting markers thereon; and to cherish and preserve the Unity of Texas as achieved and established by the fathers and mothers of the Texas Revolution. The special objective of San Jacinto Chapter shall be to further interest in the San Jacinto Battleground, San Jacinto Museum of History, and the Pioneer Memorial Log House Museum. On November 6, 1891, seventeen women met at the home of Mrs. Andrew Briscoe at this site to organize an auxiliary to the Texas Veterans Association. Mrs. Anson Jones was elected president of the new organization, Daughters of the Lone Star Republic. Goals set for the group included preserving the memories of Texas Revolution heroes, instilling Texas patriotism in the state's school children, preservation of historic sites, and promoting statewide celebrations of Texas Independence Day (March 2) and San Jacinto Day (April 21). The first annual meeting of the organization was held in Lampasas on April 21, 1892. A resolution was passed to change the group's name to The Daughters of the Republic of Texas. By 1892 the first two chapters had been formed, one in Galveston and one in Houston. The DRT has been in the forefront of many historic preservation projects throughout the state. Clara Driscoll, on behalf of the D. R. T., wrote personal checks to save the Alamo from demolition. The organization also led efforts to preserve and commemorate the San Jacinto Battlefield site, and maintains the old General Land Office and French Legation buildings in Austin as museums. Texas Sesquicentennial 1836 - 1986. The goal of the San Jacinto Thelma Maresh Scholarship is to recognize and award scholarships to outstanding graduating students who are extraordinary leaders, scholars and citizens in the Great Metropolitan Area of Houston. Awards will be presented during the ceremonies at the San Jacinto Battleground on April 21. The Scholarship Committee selects recipients based on leadership, scholarship and responsible citizenship. The applicant must be a high school senior, citizen of the United States, and have a minimum GPA of 3.0. The completed application, along with two letters of recommendation, an essay, photo and transcripts will be reviewed by the Scholarship Committee. A woman who has applied for SJC DRT membership but has not been successful in proving her ancestry and who has a deep interest in furthering the objectives of DRT may become an associate member. An associate member does not have the privilege of voting or holding office and pays only chapter dues. An associate member may serve on committees, but may not chair the committee. Associate membership is applicable to San Jacinto Chapter DRT only and is not transferable. 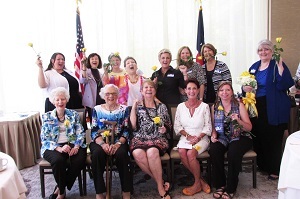 A person, male or female, who has actively worked to further the objectives of The Daughters of the Republic of Texas, may be presented to the Executive Board for consideration as an Honorary Member. If the Board deems the person is acceptable, their name must be read at two regular SJC DRT meetings before being awarded Honorary Membership. An honorary member does not have the privilege of voting or holding office and pays no dues. An honorary member may serve on committees, but may not chair the committee. 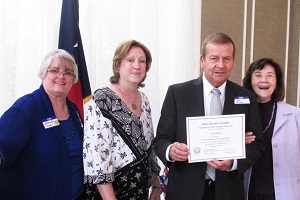 Honorary membership is applicable to San Jacinto Chapter DRT only and is not transferable.